A cold-blooded killer, Pendles the Roa hails the water-world of Akopos. But don’t let his sweet pair of sneakers fool you. This assassin will sneak up behind you, eviscerate you with poisoned kamas, then slink away again in a blink of his one remaining eye. Pendles’ cloak activates when out of line-of-sight of enemies. Pendles’ movement speed increases while cloaked, but decreases while uncloaked. Pendles’ primary attack utilizes his Dual Kamas in a flurry of strikes, while his secondary attack hurls a ranged Throwing Star. Pendles’ natural evasive abilities grant him decreased CC Duration. Pendles throws a Smoke Bomb at his feet, dealing initial damage and more over time. In addition, it instantly cloaks him. 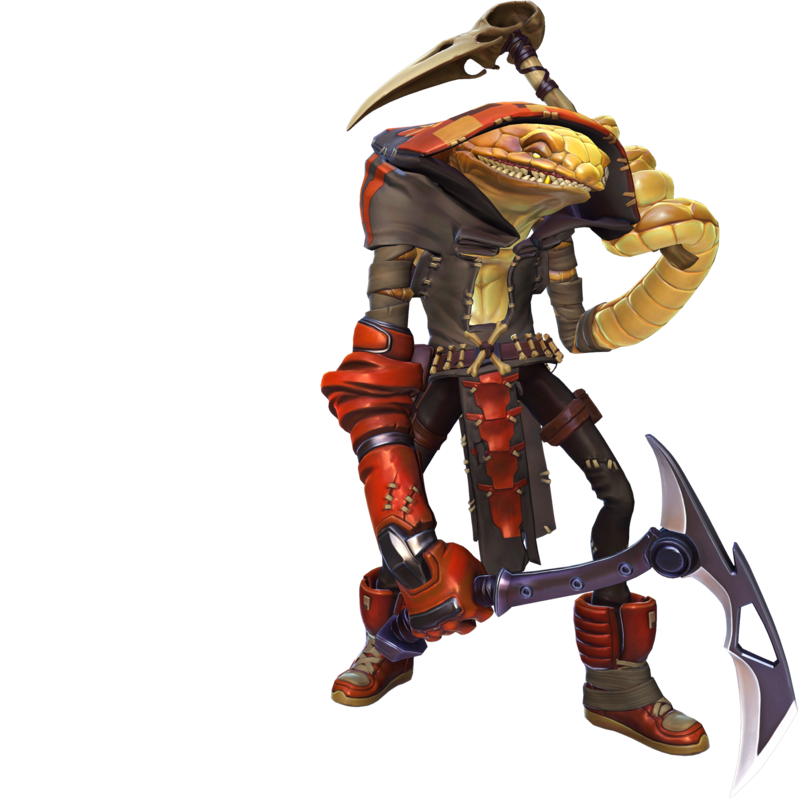 Pendles applies poison to his kamas and viciously strikes enemies dealing damage and slowing the target. Pendles covers himself in an airborne poison that deals damage over time. While Miasma is active, Injection’s cooldown is reduced. Increases the duration of Smoke Bomb’s poison cloud. Enemies hit by Smoke Bomb are blinded for a short time. Adds a life steal effect to Pendles’ Kamas. A portion of the health damage dealt by Injection is returned to Pendles as health. Pendles takes reduced damage while cloaked. Smoke Bomb propels Pendles backwards. Increases the height of Pendles’ jump. Pendles’ melee attacks reduce Injection’s cooldown. Enemies affected by Miasma’s aura are wounded. Smoke Bombs can now be thrown. Pendles throws additional Throwing Stars in every throw. While Miasma is active, Injection’s damage is increased against enemies with low health.